The new Megamenu came out from the need to push the web development to the next level. It's arrival also changed the classic navigation systems by adding improvements. Megamenu upgraded it's brothers by giving them additional class and menu item description or slogan line, but also upgraded the template functions by adding menu override options. In this section we are going to show you how to set up the Megamenu, the third generation navigation system. This is a step by step guide on how to edit your main menu to add more value to your website. the document ends with a complete parameter reference that will explain all parameters and their relations to the classic navigation systems. If you need a hand understanding the basics of Joomla! Menu Management, please refer to Menu Management Reference. This image suggests no parameters used in this particular case. We will start to set more and more parameters and explain how to make it look just like the demo, but first let's see the checklist. Please note that using JA Purity II or JA T3 Blank quickstart packs do not require to follow this checklist, it is only for manual installation. To be able to add icons to your menu items, first you are going to upload your favorite icons to the your_site_root/images/stories folder. Please note that the icons must not exceed 16x16 pixels, a must if you want avoid layout breaks. 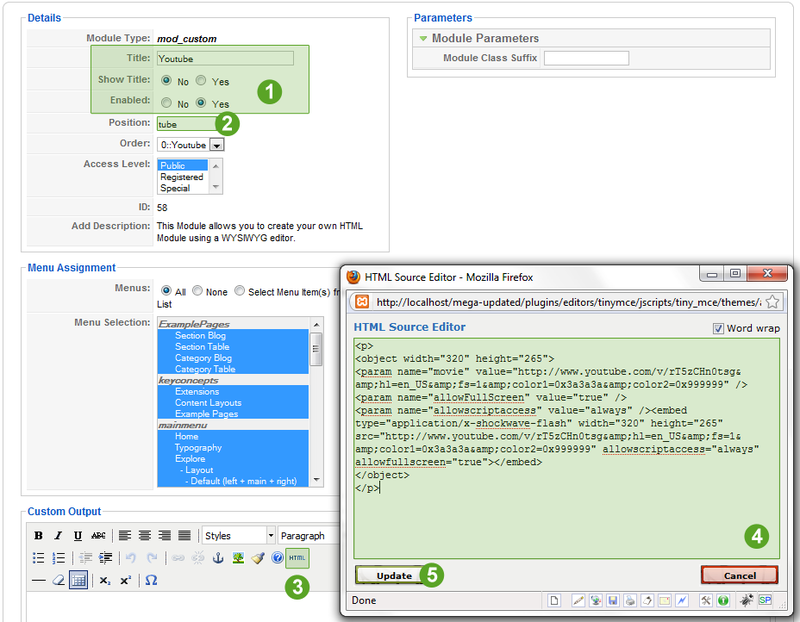 Advanced users can make this possible by customizing menus style classes. Next, in the backend administration of your website, navigate to Menus - Main Menu, and then we will click on Home to add an appropriate icon for it. click the Save button to apply these changes. Now let's do the same for Typography menu item, then go to the frontend, refresh the page and see how it looks like! 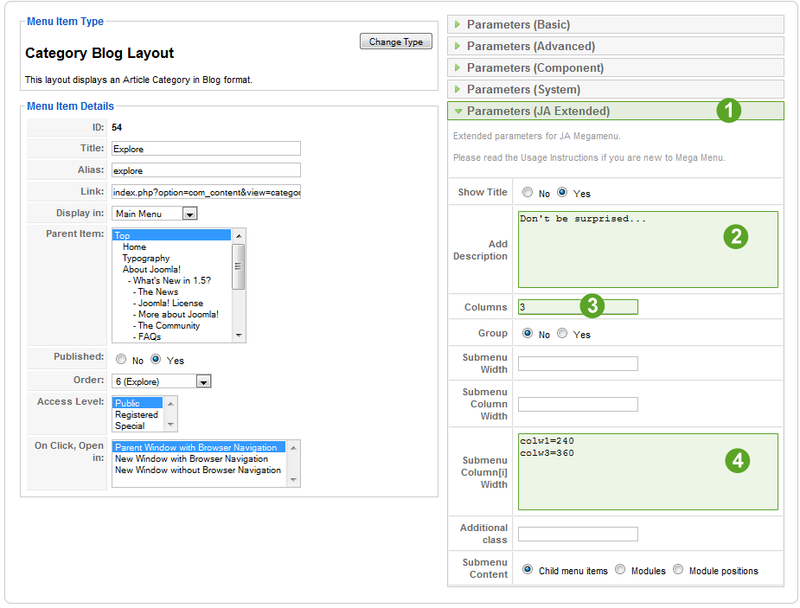 The first versions of T3 templates used to add these megamenu parameters in the menu item titles and this caused SEO related problems. To find out what changed, please read this forum announcement. Youtube (originally was Vimeo, but we changed it just to show you later how to deal with it). We are going to edit each one of them, as we need to show up their child menu items or child content along with these parent items. We are going to click the Layout menu item to edit it. 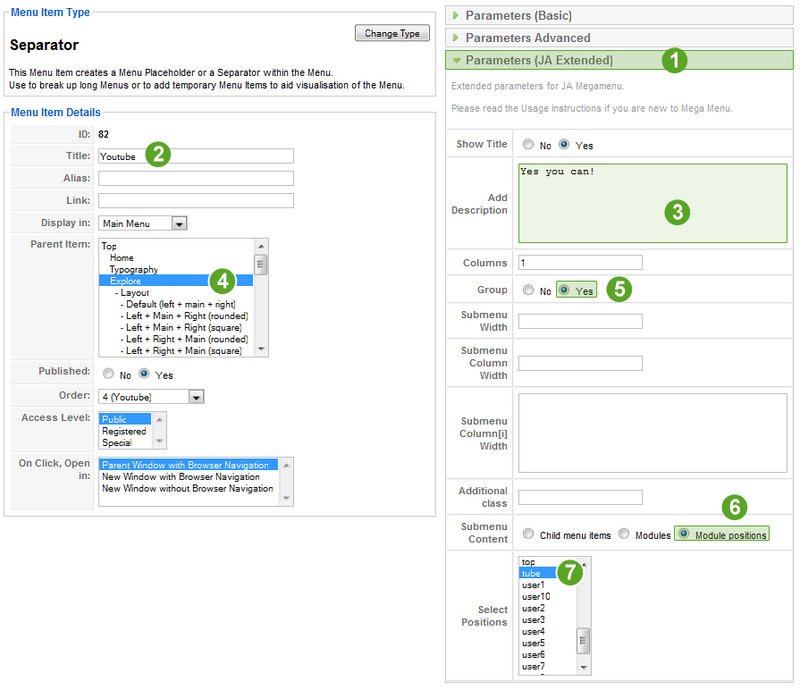 As you see in the image above, just by selecting Yes for the Group option will group the Layout menu item with it's child menu items into a compact column, and the parent menu item Layout becomes the head of the first column of the main menu item Explore. 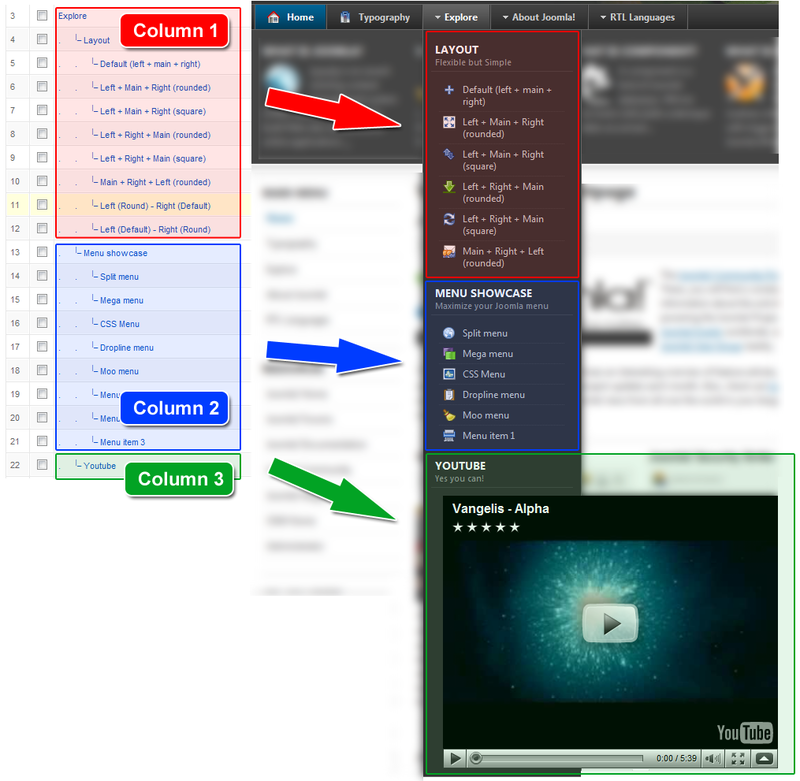 Now we can do the same thing for the other two parent menu items: Menu Showcase and Youtube. Please note that this parameter only applies for megamenu navigation system. Click the Save button, go to frontend, refresh the page and see the changes. you can also load unique module positions you have set for your modules, position that are not defined in your template. Please note that child content items will only show up for megamenu navigation system, for the others, CSS Menu, Moo Menu, Split Menu and Dropline Menu, the navigation bar will only show up menu titles. click the Save button and go to frontend, refresh the page, and hover your mouse over the new menu item. We have shown you above a Youtube video player as a menu item. Now we are going to explain how to do that, so first let's create a new Custom HTML module. Go to Module Manager, then click the New button. now you are going to click the Save button to save the module configuration. Step 7 - remember the unique module position name tube we have assigned our custom module to? We are going to select it now! 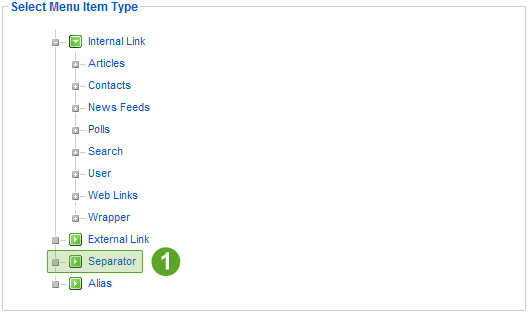 click the Save button to save the new menu item configuration, go to frontend, refresh the page and see the changes. 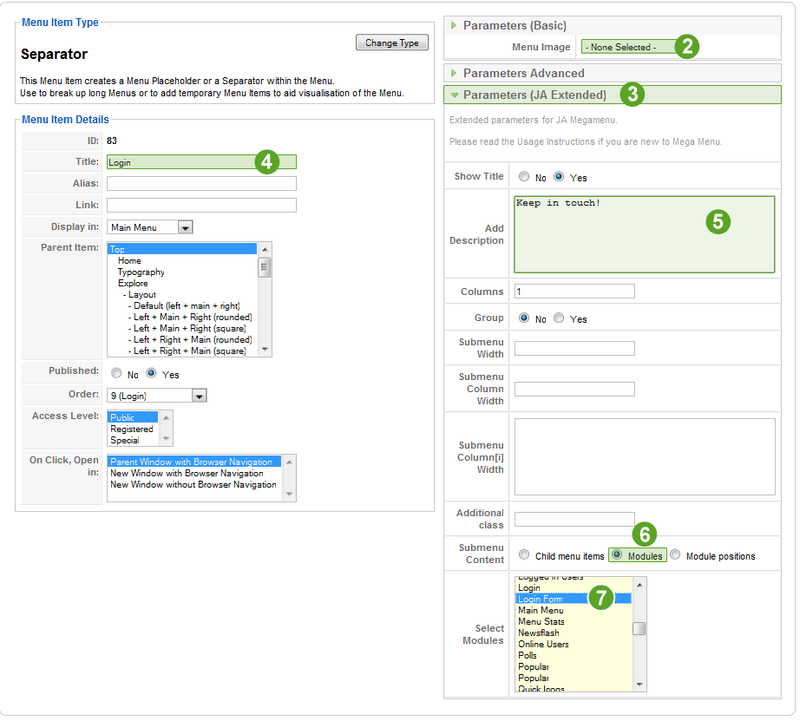 The result of these changes can be viewed in the Setting up columns section. In this section we would like to build a complete reference for all T3 Navigation System Parameters. We are going to explain each parameter: functions, usage, values and examples of best practices. TIP: hovering your mouse pointer over each of the parameters in the menu item editing panel, basic usage instructions will pop-up and give you a hint on how to setup the parameters. Setting this parameter to No, will hide the menu item title. this parameter only applies to megamenu navigation system. This parameter is useful for menu items you don't want to show up in frontend, but you need a unique Itemid value for that menu item to be used by child content pages. Example: you want to use a menu item for user registration, but you don't want this menu item to be visible, because registered users that click this menu item while are logged in, they will get a critical error, so it is better to hide this menu item's title, as long as we have it published and passing it's Itemid value to all registration links. this parameter applies for all navigation systems: CSS Menu, Moo Menu, Split Menu, Dropline Menu and Mega Menu. This parameter will override the default width of 200 pixels for a specific column or more. child2 - custom module with a 200x250px banner <-> this is the second column. Please note that loading objects as menu items sometimes requires to use a column width of 15-20px higher value than the width of the object. We have done the same thing in this example here, to let the child content area wrap around the object. this parameter applies to all navigation systems. using this option will produce no effect on any menu system, but switching to this option, will disable loading additional content for megamenu navigation system. this option only affects megamenu and enables the first method of loading modules as menu items. 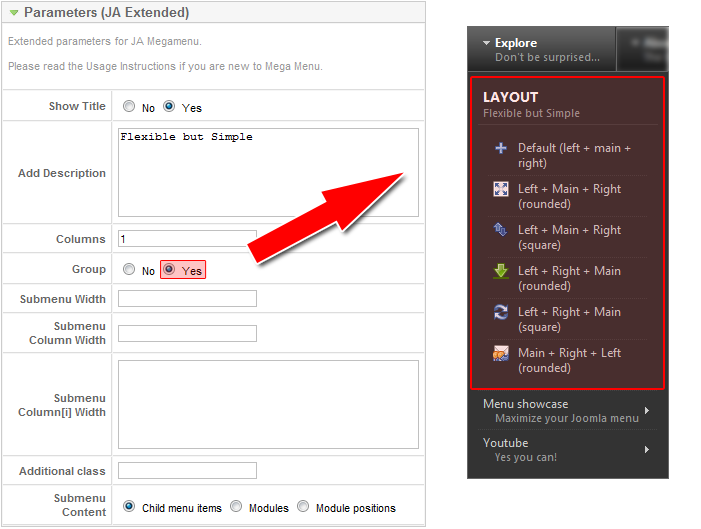 this option only affects megamenu and enables the second method of loading modules as menu items. before introducing the JA Menu Parameters plugin there were 2 parameters: left=1 and right=1, used to make the child content area of a parent item float to the left or to the right, to avoid displaying portions of the child content area outside the template wrapper, but now, if the width of the child content area is very wide, the child content is moved to the left (or right in RTL mode) just enough to display the child content properly. If you want to find out how to customize T3 Navigation Systems, please visit our designated documentation section. For any questions you might have regarding usage or customization of T3 Navigation Systems, please feel free to ask in our forums. Enjoy developing with T3 JA Framework!